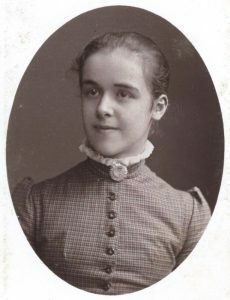 Louisa Jane Bryer, age about 13, Crossley Heath Orphan School, Halifax, England. Crossley Heath Archives, CP 1662. Louisa Jane Bryer, known by the family as “Cousin Louie” was my grandmother’s first cousin. Her visits to the family farm in the late 1940s were always exciting. 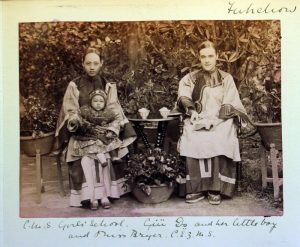 Although I was too young at the time to have any memories of her, the stories she told about her thirty years as an Anglican missionary in China became part of family folklore. My cousins remembered Louie shuffling her way to church every Sunday and were convinced that her feet had been bound in China. She told my oldest brother that learning Chinese was very difficult, and that she had to take her bath in public so that the village people would not think she was evil (this seems hard to believe in retrospect). The kids would try to get her to say something naughty in Chinese (for a missionary) and once in a while she would indulge them by saying, “Bring me a glass of water” in Chinese, and then change the tones to mean, “Bring me a dog’s head”. 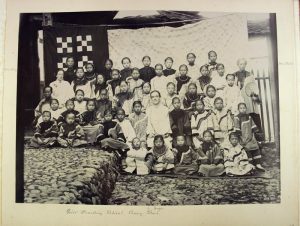 Louisa Jane Bryer in local dress, Church of England Zenana Missionary Society, Ciong-Bau, Fujian Province, China, and guest. Photo c. 1894-98. Photo courtesy University of Birmingham Archives. 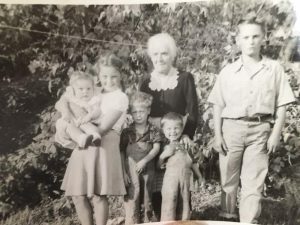 Cousin Louie and the Milligan children, c. 1948. Photo – author’s collection.